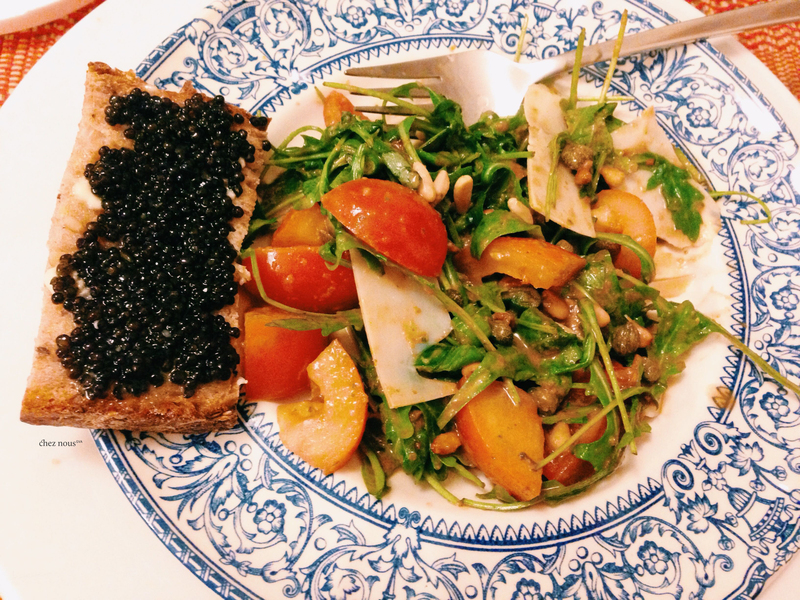 New year’s eve just came around the corner, and our petite cuisine was full of fruits (for good luck) and a light NYE dinner (for a guilt-free but pleasing welcome-2015 meal). We are big foie gras lovers chez nous, so the holiday season is a good excuse for us to indulge ourselves with this French delicacy. Don’t ask how much we consumed this season. It’s enough to make us ashamed and guilty for at least the entire 2015 or maybe another year more. 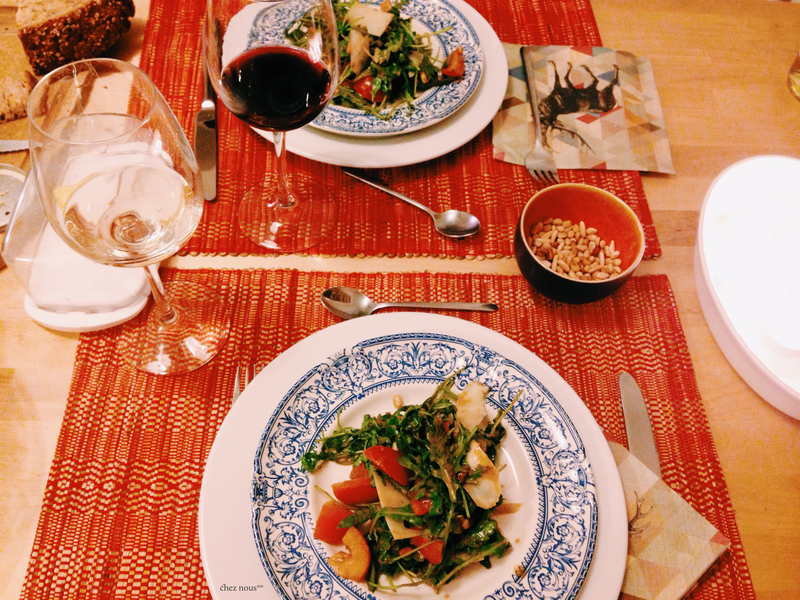 We started the evening with a tomato rucola salad with an anchovy vinaigrette. There was also that indulgent toast with caviar. Great source for Omega-3, the glorified caviar, so relish a bit of those fish eggs from time to time. 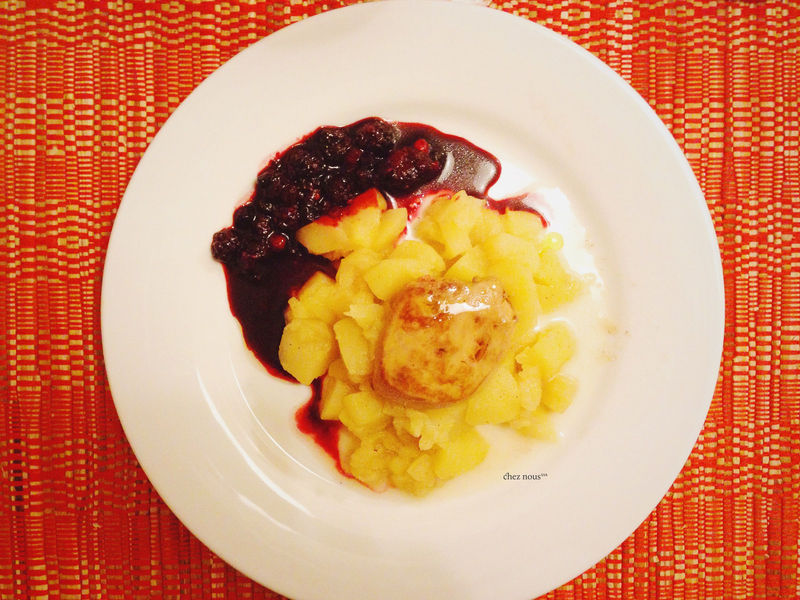 And for the main act, we had cooked apples and pan-seared foie gras with a mixed berry sauce. It was rich and beautiful with a nice combination of sweet and salty tones tugging at each other inside our mouths. Yumm! Simply blend all vinaigrette ingredients in a food processor or blender. This dressing will be more than enough for a salad for 2-4. Keep the rest in the fridge and you have a vinaigrette for those salad dinners during the week. Toss the rucola, tomatoes and pine nuts in a bowl and pour some of the dressing over it. Toss to cover the rucola leaves and tomatoes with the dressing. Top with a few gruyere cheese shavings. Put the apples, sugar and butter in a pot. Cover with water and leave to simmer for 15 minutes. For the mixed berry sauce, simply place all berries in a pan with a bit of water let it cook for 5 minutes (10 minutes if using frozen berries) over medium heat. Make sure to add water if it’s drying up. And finally, for the foie gras, heat the pan without oil over medium heat. Put the medallions into the pan add a pinch of salt and pepper and leave to cook for 7 minutes on each side. Serve the pan-seared foie gras over the cooked apples with the berry sauce on the side and devour immediately.